Providence 53 is a beach & breaker view penthouse unit consisting of 3 bedrooms and 2 bathrooms, sleeping up to 8 guests (max 6 adults). This spacious unit comprises of an open plan kitchen which features a glass top stove, oven, fridge/freezer, microwave & dishwasher & breakfast nook. The large dining area has 2 dining tables, one glass table seating 4 & and an oak table seating 8. The lounge is fitted with cane furniture. There is a flat screen TV with DSTV Explora with all TV channels & music for an extra R40 per day. Off the lounge is a sliding door leading onto a large undercover patio boasting magnificent sea, beach, breaker & river views. Patio table & chairs for 8 and a gas braai. Off the main bedroom is a sliding door to the patio with a beautiful view. This room is fitted with king size bed & en suite bathroom with a bath, bidet, double basin & shower. The second bedroom has a queen size bed & third has 2 double bunk beds sleeping 4. The second bathroom has a bath and shower. All linen & bath towels provided. There is very good security with trellidor & security gate. There is a garage and carport provided as well as a swimming pool, play area & clubhouse with snooker table & dartboard. 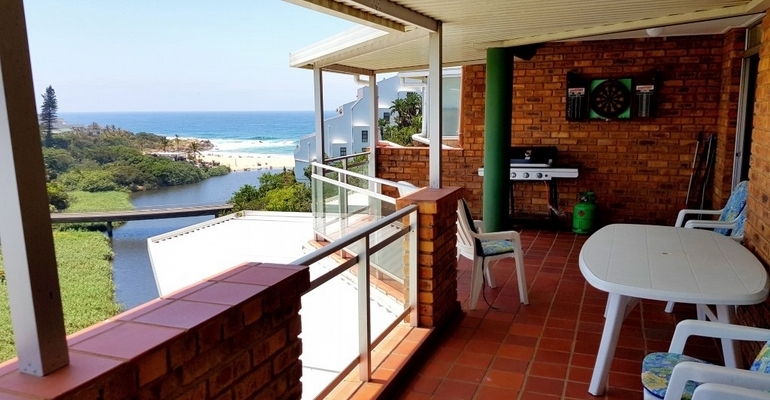 This unit is within a 5 minute walk to Ramsgate main blue flag beach with shops & restaurants in immediate vicinity. Our rates start from R950.00 to R1850.00 per night depending on season.